Board of Education member Jill Ortman-Fouse, who is running for Council At-Large, has filed for matching funds from the county’s public financing system. Ortman-Fouse took 49 days from the date on which she established her campaign committee to apply for matching funds, a FAR shorter period of time than any other candidate. Ortman-Fouse’s application, made on April 16, lists $23,466 in contributions from 368 county residents, exceeding the Council At-Large thresholds of $20,000 and 250 residents. 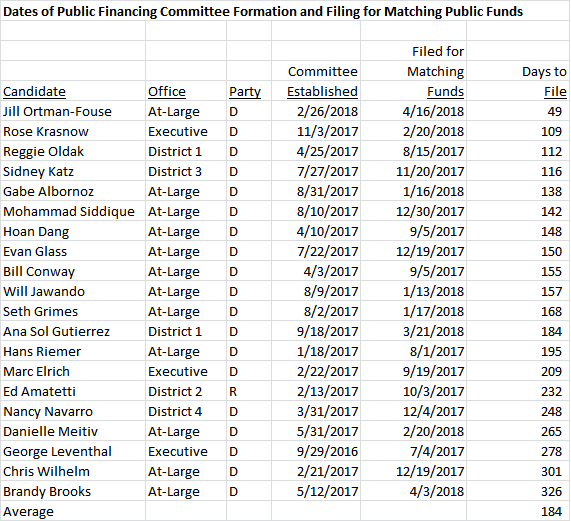 Below is the number of days between committee establishment and matching funds application for the twenty candidates in public financing who have applied for matching funds. (Five other candidates submitted applications but were ruled ineligible by the State Board of Elections.) Bear in mind as you read the stats below that the candidates have different qualification thresholds. Executive candidates must collect $40,000 from 500 county residents. District council candidates must collect $10,000 from 125 residents. Ortman-Fouse totally smoked her competition in filing time, something that is going to turn heads among her competitors. In just one term, she has become arguably the most popular school board member in the county since Blair Ewing, who left to run for County Council twenty years ago. One reason for that status is her close attention to answering constituent questions and her constant social media interaction with them, something that is typical of the best elected officials in county and state governments but is unusual for school board members. That has given her a network of supporters that approaches the level of incumbent County Council Members. How far that penetrates into the rank-and-file voting public is unknown, however, as few voters can name their school board members. And Ortman-Fouse has also been handicapped by her late start, missing out on the endorsement processes of many influential organizations. That leaves us with a general observation. It’s true that the top fundraisers in the Council At-Large race are men and that men have received most of the influential institutional endorsements (with some going to Brandy Brooks and Danielle Meitiv). But the Democratic primary electorate is roughly 60% female and of the seven councils in the current structure since 1990, only one (the 1998-2002 council) lacked a female at-large member. So don’t count out the women, dear readers – and especially not Jill Ortman-Fouse!